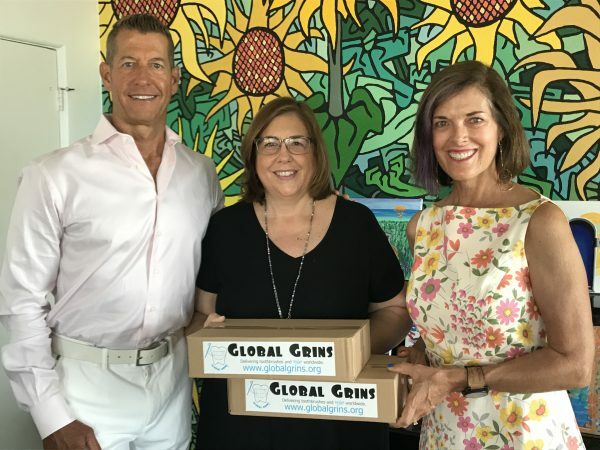 Laguna locals Todd and Joselyn Miller, founders of the nonprofit Global Grins, celebrated the delivery of their one-millionth toothbrush this week. The recipient was Laguna’s own Friendship Shelter. Global Grins has donated toothbrushes to individuals in more than 100 countries and in nearly all 50 states. After traveling the world, the Millers realized that billions of people worldwide do not have access to toothbrushes, a vital tool in maintaining dental health. The grassroots organization relies on volunteers to deliver toothbrushes to orphanages, shelters, schools and other organizations. Recently, Global Grins’ toothbrushes have been delivered to the U.S. Embassy in Guyana and an orphanage in Burma. The U.S. Air Force even delivered toothbrushes on a Pacific Angel Humanitarian Mission in Tonga. “When you see the images of these children and the conditions they live in, and then see them light up when they receive a toothbrush knowing it will improve their daily life, all of our hard work is worth it,” said Todd Miller. To learn more about Global Grins, visit www.globalgrins.com.